Yoeman Jessica Lopez served her country for years, and many groups came together to help repay that service. As a Navy yeoman, Jessica Lopez ensured that her fellow soldiers were never forgotten, working to identify and recover MIAs from Vietnam and Laos. 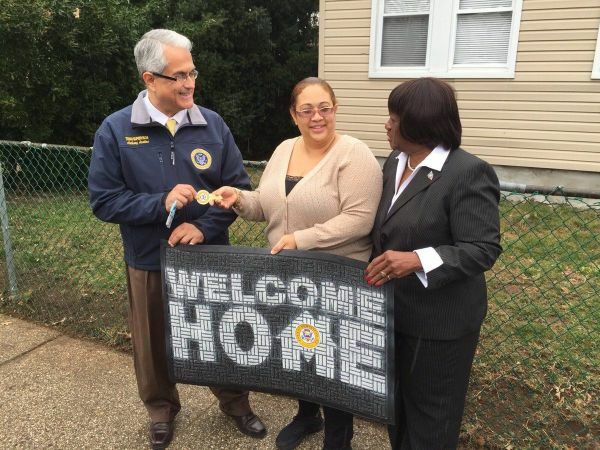 On Wednesday, the Town of Hempstead helped to repay her for her service as Supervisor Anthony J. Santino and Councilwoman Dorothy Goosby presented her with the keys to a newly refurbished, affordable rental home in Roosevelt, where she will live with her husband and five children. The home, located on East Pennywood Avenue in Roosevelt, is a single-family house with four bedrooms, two bathrooms, a full kitchen and a finished basement. The town’s housing authority acquired the home through the Meadowbrook Development Corporation – a not-for-profit organization under the Town of Hempstead Housing Authority – which provides affordable housing options for veterans and senior citizens. The purchase of the house by the not-for-profit agency – $212,000 for the house, $31,000 for repairs – was made possible through a federal HUD grant secured by the housing authority. A host of agencies and people joined forces to make the new home affordable and welcoming. The Supportive Services for Veteran Families will pay the security deposit, brokers fee and first month’s rent. Two contractors who performed home improvements at the house, Seaford Plumbing and G&M Mechanical, have underwritten the donation of home furnishings. And Hempstead Town’s Housing Authority has ensured a below market rental rate of $2,100. Comparable market rates for similar homes are estimated at $3,500. The town’s Housing Authority will explore affordable purchase options for the refurbished home with the veteran’s family. Lopez served as a yeoman in the United States Navy from 1996-99, training members of the armed forces to identify the remains of soldiers who fought in the Vietnam War. Through her committed efforts, Lopez was able to bring closure and peace of mind to many families across the United States. At the same time, the heart-wrenching duty took its toll on Lopez, who suffers from PTSD as a result of her service. Hempstead Town officials saluted Lopez at her new home, presenting her with the “key to the town” for her bravery and patriotism.